At the beginning of this year (2012), I shared a New York Times article entitled "Cracking Open the Scientific Process" (see that article at http://nyti.ms/PjKZpS). That share seemed to encourage my friend Manny Hernandez (founder of the Diabetes Hands Foundation/TuDiabetes and EsTuDiabetes, catch his post HERE) to come out of his personal blogging hiatus. That New York Times article wrote about the 200th anniversary of the New England Journal of Medicine this year. However, although the traditional scientific process still works, it is agonizingly slow, hence it's not really cause for celebration. To use an analogy, typing papers works too, but no one does that anymore, and with very good reason; it simply isn't as good as using word processing software is (with built-in spell-checking and formatting functions) and today, it's a real challenge to even find typewriter ribbons anymore. Indeed, if one looks to television as an example, consider the TV show "Murder She Wrote" starring Angela Lansbury as an example. The opening sequence of that show depicted the lead character Jessica Fletcher typing on an old-fashioned typewriter, but by that time that show ended in 1996, she was actually using a word processor! Yet it seems as if diabetes researchers are still using old-fashioned typewriters. "For centuries, this is how science has operated — through research done in private, then submitted to science and medical journals to be reviewed by peers and published for the benefit of other researchers and the public at large. But to many scientists, the longevity of that process is nothing to celebrate. The system is hidebound, expensive and elitist, they say. Peer review can take months, journal subscriptions can be prohibitively costly, and a handful of gatekeepers limit the flow of information. It is an ideal system for sharing knowledge, said the quantum physicist Michael Nielsen, only 'if you’re stuck with 17th-century technology.'" As I wrote a while ago in my post "The $100,000 Diabetes Cure", there are many reasons for this, notably the fact that this is the way academia has always worked. But that doesn't mean the process is flawless. Anyone who lives life with a chronic disease like diabetes who has ever heard that a cure, or even the so-called "artificial pancreas" would be around in 10-20 years no doubt agrees. The current medical research process is just too darn slow, and the incredible sluggishness of that process is a genuine problem in an era where advances in most other areas of science seem to be leapfrogging those in medicine. One need look no further than computer technology, for example, to see of how technology can advance with less encumbered research and development process. Consider that as recently as 30 years ago, the PC or "personal computer" was still pretty much a dream that a few geeks envisioned might become possible someday in the future. Today, not only have PCs become mass-market devices, but many people now also have mobile phones (which were pretty new back in 1982, did any of my readers have a Commodore 64 back in the day? ), but today, your smartphones (Apple iPhone or Samsung Android phones, for example) have as much processing power and capability as early PCs did back in 1982, plus you can play your whole music collections on it or surf the internet on it, too, all in a device that literally fits in your pocket. But when it comes to diabetes research, the process has been agonizingly slow. That's frustrated some generous donors to nonprofit organizations that support cure-specific diabetes research. One such family is Bill and Delores (Dee) Brehm. Mr. Brehm is a University of Michigan alumni and a longtime supporter of his alma mater. Today, the couple lives in the D.C. suburbs in Virginia, and while the Brehms have also been long-time JDRF supporters and still are, today, they are putting more of their personal resources into something they've dubbed "The Brehm Coalition" (http://www.brehmcoalition.org/) which they began in 2007 instead. They are using their generosity to try and fundamentally change the way diabetes cure-related research actually gets done. 'I don't know why I said it,' Dee says today. 'But that kitchen conversation changed the direction of our lives.' Dee knows that her husband takes no challenge lightly." (see HERE for more). While they have long generously donated their own money towards diabetes cure research including a center at their alma matter at University of Michigan (to the tune of over $44 million), they also saw other technologies progressing much faster than medical research for cure-related research in diabetes was, so they asked if something could be done differently? Frustrated by the agonizingly slow pace of advances in diabetes, they aimed to shake that comfortable establishment up by putting their own financial resources into it. But unlike average donors, their generosity and philanthropy is significant enough to get noticed. (Incidentally, Dee Brehm was was also chronicled in Diabetes Health magazine back in 2008, see HERE for that article). They saw the current review "process" used in medical research as something that was delaying advances, and it was something that needed rethinking. Hence instead of putting their donations towards an existing diabetes charity like the JDRF (which they continue to support, incidentally, just not at the same levels they once did), the Brehm's decided to try and shake up the diabetes medical research establishment. "The Brehm Coalition is a unique group of nine senior scientists from eight universities devoted to the creation of a new paradigm in medical research based on an unprecedented level and style of laboratory collaboration. Their chosen research pathways are aimed at accelerating the search for a cure for Type 1 diabetes. Under the leadership of the nine Brehm Coalition researchers, over 100 individuals are working to fulfill the Coalition's research mission - to cure type 1 diabetes." 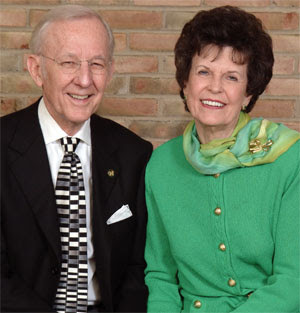 In 2004, Dee and Bill Brehm gave the largest gift in the history of the University of Michigan Health System, and the second-largest ever received by the University. The gift stands apart not only for its size but also for its vision. The Brehm Coalition is indeed following the "Science 2.0" model as Manny Hernandez described it, and what an incredible roster of core participants they have. "The Brehm Coalition members are located hundreds and even thousands of miles apart from one another. However, direct communication, so essential to close collaboration -- is accomplished with face-to-face reviews three times per year, and simulated 'face-to-face' meetings once a month using a combination of desktop videoconferencing and application sharing. This setup allows seamless communication and high-definition video clarity, and is used not only for the monthly conferences involving all nine members of the Coalition, but for more frequent conversations among the scientists as the need arises. No 'appointments' are necessary to connect. The system virtually eliminates the heavy time and cost burdens associated with traveling and promotes the highest level of group interaction and communication simply because it is easy to use. Further innovations in communication are under development by the Office of Enabling Technologies at the University of Michigan Medical School as part of the infrastructure support of the Coalition." The idea of collaboration is key here. Instead of waiting for months for something to be reviewed and ultimately published in a journal someplace, participating members of the coalition can literally share ideas and thoughts real-time. Assembling this coalition was just the first step, and the fruits of this coalition have yet to be harvested, but this could indeed be an amazing step in the right direction. Now, before I sign off, let me just note that there are other collaborations, such as those at the Diabetes Research Institute/University of Miami's Miller School of Medicine along with their collaborators at Karolinska Institutet in Stockholm to name one example. But outside these examples of collaboration, the science simply doesn't get shared with other researchers in the same field until it gets published in a journal. One can hope that the Brehm Coalition will change the way medical research is handled going forward. I mеan, what you say іs valuable аnԁ all. However imagine іf you added some grеat visuals oг video clірs to give your posts more, "pop"! one of the greatest in іts field.